A device used to make rope at the Ropewalk complex. Joe Timilty is renovating the old ‘ropes factory’ at the Charlestown Navy Yard, turning it into high end housing. Joe Timilty walks past the old hemp spools, down a fire-charred corridor that stretches as far as the eye can see, and muses about the success that is almost within his reach. He is about to accomplish a task that no other developer has been able to pull off: resurrecting the old Ropewalk complex in the Charlestown Navy Yard. Redeveloping a structure with these quirky dimensions would be tough enough — it’s more than a quarter-mile long but only 45 feet wide for most of its length. Then add the stiff historic requirements imposed by the National Park Service and the Massachusetts Historical Commission for the roughly 180-year-old granite building. 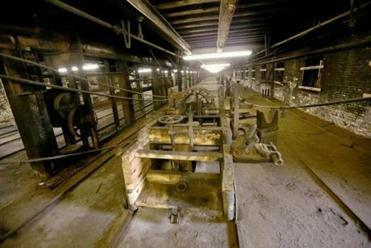 Steel tracks that run down the length of the mill, for example, must be incorporated into the design. Not Timilty. Over the years, just about every type of use has been floated for this former Navy rope factory left vacant since the early 1970s and now owned by the Boston Redevelopment Authority. Offices, housing, aquaculture labs, a museum. Some joked that it could make a great bowling alley. Finally, there’s a tentative date for the construction crews to arrive. They’ll convert this nearly 160,000-square-foot complex, including an adjacent “tar house,” into 97 apartments. To help finance the $42.5 million project, Timilty’s Boston-based firm, Frontier Enterprises Inc., has secured a loan commitment worth up to $31 million from the Massachusetts Housing Finance Agency. Now all that’s left is a final approval from the BRA for a long-term lease that will allow Frontier to take over. Timilty, a former state senator, hopes that could happen at the authority’s June meeting, and that construction can begin before Labor Day. The goal: getting the bulk of these units done by next summer, in time for the peak rental season. There will be a mix of one-, two-, and three-bedroom apartments, and Timilty hopes to command monthly rents from $2,500 to $3,500, depending on the unit. Twenty will rent for much less than that, to meet the affordable housing threshold required to get the project financed. Most of the units will be built, side-by-side, “townhouse style” within the main ropewalk facility, with doors that would open into a hallway that stretches the length of the building. Several will go in the tar house, where tar was once heated up to coat the hemp for the ropes. There will also be nods to the site’s history: a rope-making museum at one end, a stone walkway restored along the exterior, and a painted mural down the main corridor. A few handmade machines once used to pull the hemp remain in the building: They’ll be restored so they can be displayed. So why did it take so long to redevelop the site? One dominating factor is the property’s historic nature. The National Park Service has made it clear that any changes to the granite exterior walls and slate roof must be minimal. “From a historical perspective, the restrictions on reuse have had a lot of well-qualified teams scratching their heads,” said Edward O’Donnell, the BRA’s director of real estate. Timilty said the state historic commission had stringent rules requiring historically correct exterior windows, a replica of how they used to look. So developers will install a second set, because the outside windows won’t be particularly energy-efficient or soundproof on their own. At first, the National Park Service didn’t want additional doors into the building. But that limit made it nearly impossible to comply with state fire codes, given the structure’s unusual length. Eventually, the agency relented and permitted two new openings for exterior doors. 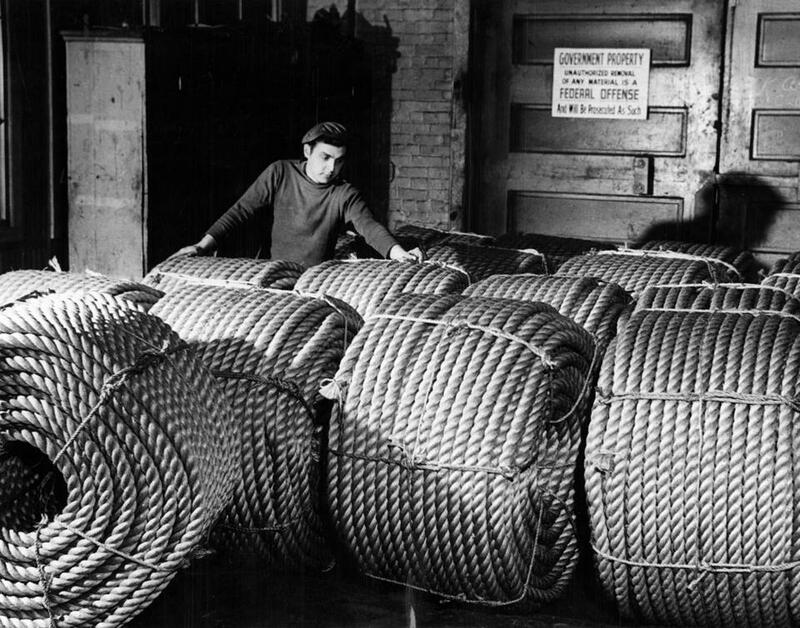 A man checked rolls of six-inch rope, ready for shipment to Naval bases for use aboard fleet ships at the Ropewalk in the Charlestown Navy Yard in Boston. Neighbors also voiced concerns that the site had no parking. So Timilty and his team came up with a solution: All renters with cars will need to show they have contracts for parking, likely either in a garage in the Navy Yard or at the “Autoport” across Chelsea Street. Help also came from City Hall. Getting this building redeveloped wasn’t a top priority under the Menino administration, Timilty said, but Mayor Martin J. Walsh has made it clear that he doesn’t want the building to sit idle for much longer. Aside from the Ropewalk, there are only two other Navy Yard buildings left to be developed. The BRA has approved plans for a 230-room hotel in the “Chain Forge” building, and officials in that agency are eager to tear down the crumbling power plant building next door to the Ropewalk. Charlestown Neighborhood Council chairman Tom Cunha said he has seen the developers come and go and was skeptical that any project would work. But Timilty, Cunha said, made it clear he would listen to the neighbors.